This posting is more or less a re-visit and an addition to a previous posting (in case the link doesn't take you to the right place, the piece was called Cinematic Impressions II) I did awhile back on Isaac Julien's nine-screen film installation called Ten Thousand Waves. However at the time when I first saw the show at Metro Pictures, I had not experienced the installation or knew enough to have a clear understanding of this work. Initially, my reading was that of Julien's attempt to exoticise the East by framing his Chinese subjects within a Western mise-en-scene. Even though my reading was not entirely a miss, nonetheless after hearing him speak at the World Leaders Forum at Columbia University last week I have learned to appreciate the work more and understand it from a different perspective. Isaac Julien was born in 1960 in London. After graduating from St. Martin's School of Art in 1984, where he studied painting and fine art film, he founded Snakofa Film and Video Collective (1983-1992). In addition Julien was a founding member of Normal Films in 1991. In 2001, he was nominated for the Turner Prize for his films The Long Road to Maztlá (1999). During earlier part of the 1990s, Julien was awarded the Semaine de la critique prize at Cannes Film Festival for a documentary Looking for Langston (1989), also two other works, Black Skin, White Mask (1996), Young Soul Rebels (1991). 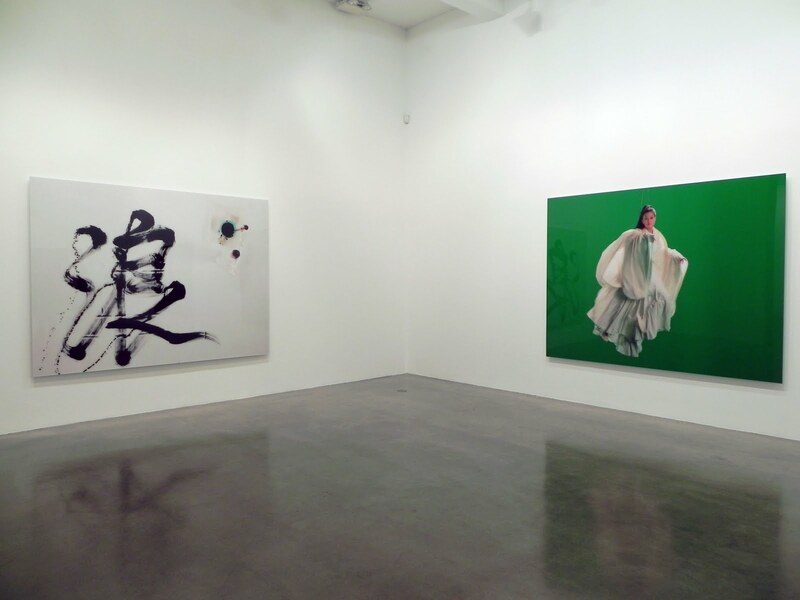 With such an impressive and accomplished his artistic repertoire, it should have come as no surprise to me that there was more to those images at Metro Pictures than their shiny surfaces. After seeing parts of the film installation, the images felt much more emotionally charged and at the same time it presented the extensive research Julien had done for this piece on the traditional and contemporary culture of China. What I loved about the film installation was that it showed images of contemporary Shanghai simultaneously with the images of old Shanghai. While heart-breakingly watched poor men from rural regions pulling the trolley taxis for the wealthy city-dwellers, my emotional response then quickly turned its focus to what must have been an insanely amount of pollution produced by the sudden automobile boom seen here as all backed up traffic on the newly-constructed super highways of Shanghai. All nine projections playing simultaneously, visually relating one to the other it seemed to be presenting a compressed version of modern Chinese history; dating from the 1930s during which Shanghai had its silent film starlets dancing in colonial night clubs to the 1960s, a time period during which Red Guards (mostly of teen-age students taken out of school) stormed TianAnMen Square (or the Forbidden City when China still had an Emperor), then to the more contemporary images of sky-scrapers and automobiles. The choice of showing different modes of transportation felt intentional. From manually pulled trolleys, to antiquated cable cars, to bicycles, to motor-bicycles (not motor-cycles) then finally engine-powered cars, all in one way or another suggesting movements and transformation from one era to the next for better or worse. Bridged by the sound of poetry reading (specially composed for this piece by Wang Ping) and juxtaposed with images of a mystic watery landscape and a Chinese Goddess (played by Maggie Cheung), Ten Sound Waves is a poetic documentary and a study of Chinese culture of its past and present. It is a culture that has been in constant flux, in forward motion and backward motion depending on how one likes to look at it. To find out if Ten Thousand Waves is on view near you, please check this link. The above mentioned artist talk with Isaac Julien was presented by Columbia School of the Arts, Mellon Visiting Artists and Thinkers Program and Columbia University World Leaders Forum.